While I own the entire run, I think I’ve basically only READ the first issue, the proposal issue, and #45-present for this series. I’m trying to be more diligent at "keeping up with" the series now, having finally jumped back in without forcing myself to backtrack and try to get through a 2-year queue just to "allow" myself to read current issues. I was grabbed by the Booster Gold cover of #45 or so and opted to read that "out of order" due to Booster’s presence…and kept going. Then I "had to" read #50 before coming across spoilers, which I SOMEWHAT managed to do. Now it’s been about a month since #50, meaning two more issues as the series is biweekly. I’d "misplaced" #51, but with not wanting to fall IMMEDIATELY behind again, I managed to find it, and quite enjoyed it. I went immediately into this issue–same creative team as #51–and by the end of the issue, just sat with the feeling that I want the next chapter ASAP, in a way that I didn’t even have with #50. I’m "assuming" this is a 3-issue mini-arc…something about it just "feels" like a 3-parter. Coming into this issue, we find the situation being recapped in the form of the jurors reviewing available evidence as presented to them. Bruce insists on going back over three key pieces of evidence for context. 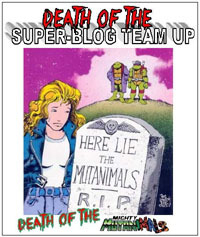 We get flashes of the actual fight between Batman and Freeze as the jurors discuss things–Mr. Freeze (barred as part of probation from donning his costume and having a freeze gun) having his costume and rebuilt a freeze gun; being prepared for Batman and what expectations he’d HAVE for a confrontation with Batman; his confession and why he stuck to it even when out of Batman’s presence. To Bruce Wayne’s fellow jurors, Batman is better than the police–he’s THE best, he’s the one who’s infallible, and if Batman delivered Freeze, then OBVIOUSLY Freeze is guilty. But Bruce has information and context that the other jurors do not and likely will not…but he must now find a way to prove his own belief in Freeze’s actual innocence of the particular crime he’s being tried for. I’m so-so regarding the art. It’s not bad, and I’d swear I’ve got a positive mental thought behind Weeks’ name in terms of art…but it just seemed somehow "off" to me here (and in #51). Perhaps it’s because of seeing some Jim Aparo art recently, and some other stuff…so on actual reading of this issue, my mind wanted other art, and so compared this to that. I’m not sure the phrasing I’m looking for, but Mr. Freeze in particular seems frail and "wiry" to me here, in a sickly sort of way…not the stronger/more powerful character I tend to picture. There’s also something to the line work that just feels rather "messy" and does so in a way that keeps me from liking it as much in and of itself. It’s surely a design/visual choice and quite intentional and not bad art…but it wouldn’t be my first choice as of reading the issue. That said, it definitely gets the story across, the jumps between Bruce and the other jurors, and the earlier interaction between Batman and Fries. The characters look human, no weird oddities to anatomy or such and the various characters are distinct, and there’s a contrast to the Batman stuff. 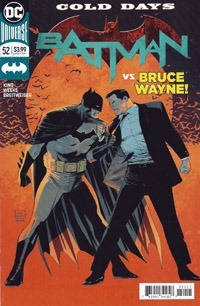 Story-wise, that contrast works very well, showing us a brutal, violent-beyond-usual Batman dealing with Mr. Freeze even while we see Bruce trying to work things out "remotely" for firstly how he didn’t catch something as Batman as well having realized he–as Batman–was wrong for going after Freeze, and must now find a way to get the criminal off, as Bruce now believes that the man is innocent of the particular crime he was brought down over…and because he knows that, it’s not (in this case) justice, and means someone else committed the crime and thus is more important to be "brought to justice." Despite any of my negative/so-so-ness about the art…as an entire package, I greatly enjoyed this issue. I want to read the next issue; and I suspect that it will be "top of the stack" due to my eagerness, in a way that #51 was not, initially, after #50. 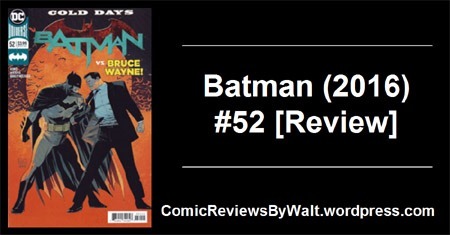 I love this use of Bruce Wayne–as Bruce Wayne, as a character, and not JUST as Batman. Seeing Bruce Wayne involved in something, interacting with others as Bruce Wayne, and even discussing Batman and seeing/reading ("hearing") certain things and getting meaning that someone who does NOT know Bruce and Batman are one and the same would not. It’s also interesting to consider the ethical things–such as Bruce serving on a jury involving a case with a man that he himself brought in, without anyone else knowing that fact. But then, a masked vigilante running around serving a greater good YET technically breaking a number of laws doing so adds other stuff to the mix. In context of Batman stories, though, I always find myself going back to Untold Legend of the Batman and a flashback of Bruce’s moment of realization that Justice and The Law are not automatically the same thing. This is a Bruce Wayne back in a familiar place thanks to a new situation; I was reminded a bit of A Lonely Place of Dying, which is certainly another factor that sparked a positive feeling for me. This isn’t for everyone, obviously…but it begins to move things forward with developments from #50, and yet almost feels like a new series. I’m very thankful this is NOT some new #2, as the numbering continuing on clearly shows that there can be a new focus and a series can feel fresh even without an arbitrary #1 slapped on the cover. The primary drawback to the issue is the price–I’d swear up to #49, this series was $2.99 and now carries the $3.99 price point. I’ve long been down on Marvel for biweekly $3.99 books, having often felt that I was very OK with DC doing the biweekly thing since the issues were 25% cheaper. As I’ve significantly trimmed back on what I’m buying, it’s not the huge thing it could be, but does have me a bit wary. Still, having read the two issues back to back and being eager for the next chapter…having enjoyed this issue and the story in and of itself…and DC still having a bit of ok will (if not entirely "good will") from me, I’ll let the point go for now. Regardless of Batman #50, one who "knows" Batman in general ought to have little trouble picking up with #51 and this issue for a good story. As part 2 of a multi issue story, I do not recommend this issue without #51…and if you don’t already have this issue, you’d probably enjoy the story better if you wait and got all 3 issues at once, if not waiting for a collected volume. For a $3.99 issue, I liked this, I’m glad to have the issue, and I’m actively looking forward to the next issue. I’ve been looking forward to this, at least in concept. Superman…and Dan Jurgens. It can’t get much better than that, right? I came into the thing expecting this to be “my” Superman sent back to help stop the Crisis and then picking up 5 or 9 or however many years later–with him, Lois, and their son (born in Convergence: Superman). Maybe I never thought through the details, maybe I was hung up on the notion of actually, finally getting “my” Superman (of sorts) back. The pre-Flashpoint Superman. What I’ve found is that Superman apparently living on the New 52 Earth (or one very much like it), with things striking me as being pretty much the same as the “current” DC Comics Superman. Having realized the world was quite different, he stuck to the background, and even went “underground,” taking the name White, and operating strictly in secret, restraining himself from getting involved. Since the New 52-ish world is similar in many ways, he’s–while operating in secret–sought to do what he can to prevent the rise of certain entities, prevent certain events from coming about. Meanwhile, Lois has written a number of books as an anonymous author, impacting the world as she can that way, while together they raise their son Jon. When I think of Dan Jurgens on Superman, everything goes back to 1992’s Superman #75, The Death of Superman…particularly VISUALLY. It’s an unconscious thing, that issue, that story being such a key part of my childhood and early days in comics. As a result…it’s a bit jarring and such when my brain wants to see Superman one way visually and get something different. Though he’s the writer, the art is actually be Lee Weeks, with a style distinctive from Jurgens‘ own. Getting past that, I like the art in this issue. Aside from “noticing” it’s not Jurgens‘ art, I really have no active/overt gripe with it. I never got pulled out of the story, out of the reading experience by any surprise or “weirdness” or such; there was no oddity to my eye with the depiction of the characters. 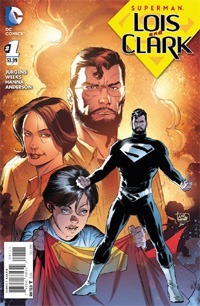 And maybe it’s my earliest issues of Superman/Adventures of Superman–when I was introduced to the modern version of the character–but I really dig Superman/Clark with a beard. Story-wise, this was a bit of an odd experience…having a lot of loaded pre-conceived expectations and notions as to what this should be, what I wanted to see, how I hoped the characters would be shown, etc. Given my personal “history” with Superman–the character being THE core of my comics-reading experience and the reason I was even first introduced TO comics–I freely admit that there’s really no way this was going to live up to my idealistic hopes. What I got is mediocre compared to what I’d hoped for. In and of itself? This was a solid issue. There’s some flashback/exposition that I’m not sure would make MUCH sense to someone just jumping onboard to “try” this, without familiarity with pre-Flashpoint continuity or having read Convergence and the Superman 2-parter from that. It provides just enough for me, to get around the lack of a textual “previously” page (and sets this up for the inevitable “graphic novel”) and to clarify that yes, this is the pre-Flashpoint Superman, yes, he went back and helped end the first Crisis, yes, he’s aware of this world’s other heroes, and despite reservations, he’s left them to their things and focused on protecting his family while helping in secret as he can. We’re introduced to a couple of elements I don’t believe have been dealt with in the New 52 Superman stuff (or if they have, it’s not been in the limited handful of stuff I have personally read/been made aware of). Intergang, and Hank Henshaw. Lois is working on something with this world’s Intergang (a dangerous proposition)…while Clark seeks to make sure that Henshaw’s spacecraft does not meet the same disaster it did in the world HE remembers. Of course, as always…the world is different, and there are other forces at play, and this is only the first issue of four or six or some such (though I’d love for it to be an ongoing series). There’s not enough here to truly display the historical significance of this version of Superman/Clark and Lois, or of their having a child, being married, etc. The significance comes from being an “old” fan, to fully appreciate the unspoken, unmentioned context that gives plenty of weight to this. I can only assume that otherwise–to a newer reader–this is nothing more than an alternate, older version of Superman. That this Superman is now what the “Earth-2” Superman may have been to others in the silver age comics, or the “pre-Crisis” Superman to readers in the time I was getting into comics. This book can surely be enjoyable for new readers and old alike, but I am on-board as the older fan/reader, and appreciating this bone I’ve been tossed, as SOMETHING for me that isn’t New 52 or some “out of continuity” one-off.